Tokyo, Japan, December 7, 2018 - Mitsui Fudosan Co., Ltd., a leading global real estate company headquartered in Tokyo and Global Brain Corporation, one of Japan’s top-tier venture capital firms announced that they invested in Axelspace Corporation, a company that develops space-based business technology using microsatellites, as lead investors of the JPY 30 billion venture investment project (the “Growth-stage Project”), which mainly targets growth-stage startups. This investment will be the first case of the Growth-stage Project. Left to right: Mitsui Fudosan Co. Ltd. Venture Co-creation Department Business Group Executive Manager Nobuyuki Tanaka, Venture Co-creation Department General Manager Akira Sugawara, Axelspace Corporation President and CEO Yuya Nakamura, Global Brain Corporation CEO Yasuhiko Yurimoto, Global Brain Corporation Partner in charge of Space & Robotics Hidetaka Aoki. Since its founding in 2008, Axelspace has developed microsatellites, and it has a proven track record of developing, launching, and operating three commercial satellites, including the Arctic Ocean observation satellite, developed for Weathernews Inc. In 2015, the company raised JPY 1.9 billion in venture capital funding and announced the construction concept of “AxelGlobe,” a global Earth observation infrastructure. A constellation of dozens of satellites, AxelGlobe will be able to capture images of virtually all of the areas where humans are economically active, accumulating and analyzing image data from the past until the present to produce insights and forecasts of natural and manufactured phenomena. Employing several dozen GRUS (remote-sensing microsatellites that weigh around 100kg each), AxelGlobe is expected to be completed by 2022. The relationship between Axelspace and Mitsui Fudosan had launched 2009, when Axelspace’s base of operations was primarily at industrial support facilities in Kashiwa City, Chiba. Axelspace Corporation received the support of General Incorporated Association TX Entrepreneur Partners (TEP), a startup-support organization based in Kashiwanoha, Chiba, where a connection was made with Mitsui Fudousan, one of its corporate members. By 2015, Axelspace Corporation needed to grow its physical space in step with its expanding business, but it soon became apparent that renovating the existing space to install a clean room to produce the microsatellites and wide doors and elevators to facilitate satellite transport was not ideal. Mitsui Fudosan constructed a bespoke building for them on a piece of land that they owned in Nihonbashi, thus forging the strong relationship of co-creation between Axelspace and Mitsui Fudosan that has resulted in this latest investment. Mitsui Fudosan invests in startups for new business development and to strengthen our core businesses. We see great potential in Axelspace’s space-based business and microsatellites, and in President Nakamura and the rest of their management team. In addition to urban development—the core business of Mitsui Fudousan—AxelGlobe can be used as countermeasures against the natural disasters that have become increasingly common in recent years. Given Axelspace’s potential to infinitely expand the application range of satellite photos, we believe that it can contribute to the creation of new industries. Mitsui Fudousan aims to create new industries that will invest in the development of society and will continue to strengthen the venture co-creation project we began developing in April 2015, as well as the Growth-stage Project. 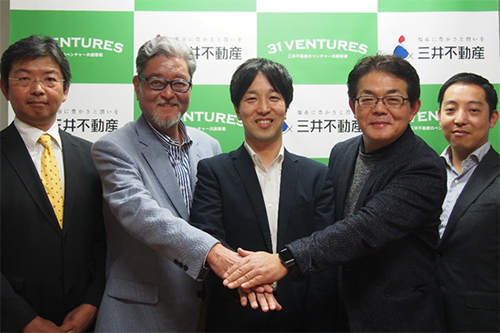 Mitsui Fudousan established the Venture Co-creation Department (31VENTURES) in April 2015 for the purpose of creating new industries to strengthen and innovate Mitsui Fudosan’s businesses. 31VENTURES aims to realize co-creation of new industries together with startups through its fully integrated venture capital services of “Finance,” “Support” and “Community”. In 2016, we established “31VENTURES Global Innovation Fund I”, the JPY 5 billion corporate venture capital fund, with Global Brain and have invested in domestic and international startups primarily in their early stages. In May 2018, both companies announced the JPY 30 billion Growth-stage Project that targets growth-stage startups with innovative technologies and/or services primarily in Japan. Global Brain is one of the top-tier venture capital firms in Japan. By leveraging its global reach and a broad network of Japanese major corporations, Global Brain provides hands-on supports to its portfolio companies, grow with them, and strive to bring innovations to the industry and the society. Based in Tokyo, San Francisco, Seoul, and Singapore, Global Brain is committed to providing startups with the support they need to scale the business and go global. With Mitsui Fudousan, it established the JPY 5 billion “31VENTURES Global Innovation Fund I” in 2015 and the JPY 30 billion “31VENTURES–Global Brain–Growth I Project” in 2018. To date, their total managed assets exceed JPY 100 billion.